What do you do with an email message after you have read it, responded and made the necessary notes? Or after you have deliberately decided to ignore it? You have to tackle your fear of forgetting and ask the two key questions: When will I need this information? How will I look for it? If you can’t definitely answer the fist question, most likely you simply need to archive the email message. You’ll find it in your mail when needed. If you might need the information for specific projects or as a general reference you need to save it in your project or reference management system. A few years ago I used Microsoft Outlook and sorted all my email into hierarchical folders. By and large, it worked, but I remember the resistance to decide where to put a particular message. Often, micro-agonizing over such decisions would slow down and disrupt my work. I would also sometimes loose messages because they were placed in wrong folders or because I would forget where I had moved them. With the current amount of email I receive, sorting it in folders is no longer an option. So I am glad I stopped doing this when I switched to Mac. Here is what I do instead. Following the main Gmail principle I archive all processed messages in one mailbox (called Archive). To make this archiving fast I have a program called Mail Act-On. It allows to set up the so-called ActOn Rules which associate a keyboard shortcut with one or several actions. So I have the shortcut Ctrl-A for archiving and that’s for sure the most used shortcut in my life. Archiving all email by pressing Ctrl-A is the perfect implementation of the principle of automation. You don’t think about it at all. First, I stopped making difficult decisions about whether to store or to delete email. I store everything except the most obvious junk. I have decided that my time and attention are more important than harddrive space. So I am not wasting these on deciding whether I would need a particular email. I might. Pressing Ctrl-A is as fast and thoughtless as pressing the Delete key, so I spare myself the choice between the two. Secondly , I don’t need to worry about losing my messages. Since switching to Mac I never lost a single email and I seem to be able to find what I need in seconds (in contrast to my colleagues using folders in Web- and PC-based systems). I do it by simple search. The sender’s name and the approximate date of sending yields results in 95% of the cases. Sometimes I need to search on a word in the Subject line. If nothing else works, I find my messages through searching through their full texts. This happens very rarely. Apple Mail for Lion which I installed just moments ago has a much more advanced search system, so I expect even smoother searches. Gmail offers you a possibility to Label messages. Labeling is similar to sorting into folders except labels are non-hierarchical and one message can have several labels. 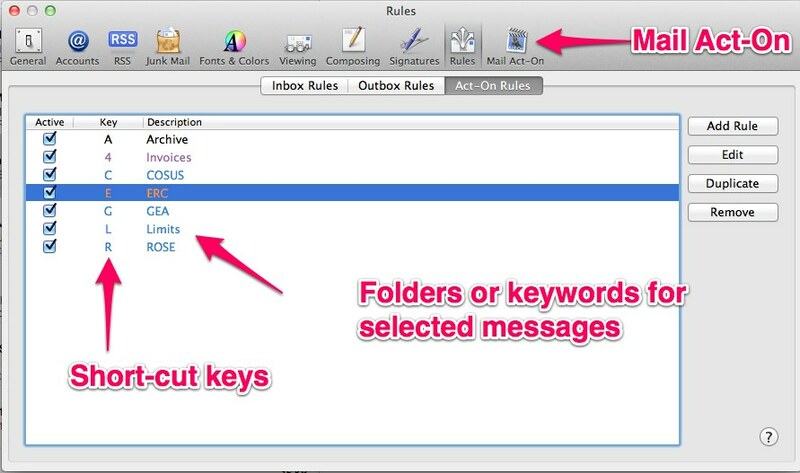 There is a program called Mail Tags which allows assigning keywords (and much more) in Apple Mail. I tried to use these keywords (especially tempting since they are compatible with OpenMeta tags) but I found it too disruptive and not very useful. If I want to use my email as project support information or general reference I now use other methods which I plan to describe in a separate entry. See, for example, the post on using color flags and on using MailTags projects (synced with OmniFocus projects) for email organization. So essentially I rely on Search function to find past emails. There are still a few situations when I add extra precautions to make sure I can find my email. These situations usually relate to messages where I would not easily remember their sender and which I will like need to find. Examples include various booking and invoices as well as complex projects with many participants (mostly unknown to me) and a large amount of correspondence. I sort such email into specific IMAP folders (which are represented as labels in Google Mail) and I have a Mail Act-On shortcut key assigned to each of them (see picture above). I only use 6 such keys at the moment (in contrast to some 70 projects that I am running). The last question is what to do with mail attachments. In most cases I can afford to simply archive them with the messages. If I receive especially large (> 5 Mb) attachments from people who have not yet discovered Dropbox I use the Menu command Remove Attachment to get rid of them and save my disk space. Naturally, if an attachment contains useful project or general reference information it should be processed as all reference files. In short, it means that I save it either in the relevant project folder or in the Downloads folder. In the latter case I assign a suffix (e.g. @a) which signals to Hazel that the file should be automatically processed. 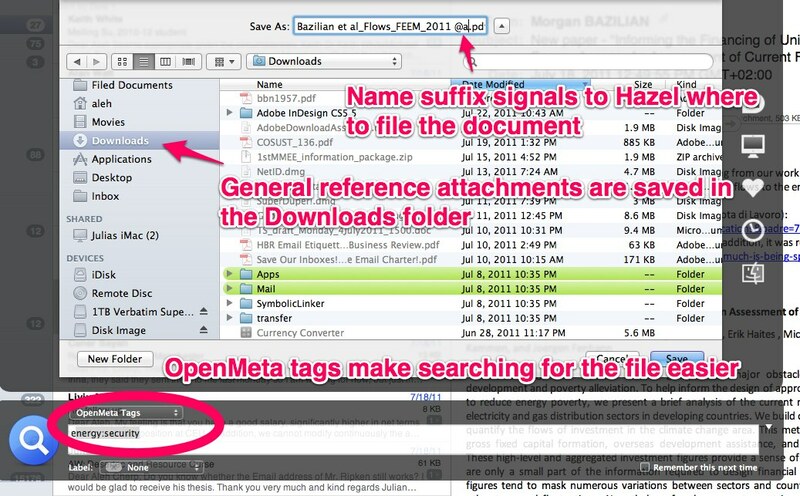 In case of general reference files I also add OpenMeta tags using DefaultFolderX (see picture below). And do not forget the main principle of tagging: use the tags which you are likely to think about when looking for this document a year from now. This entry was posted in Automation, Email, Tags and folders and tagged DefaultFolderX, MailActOn, MailTags, OpenMeta. Bookmark the permalink. Great post, Alan. Archive folder will be located “on my mac” or below my Gmail IMAP folder? Thanks for your help! If you define a custom’s archiving rule you can decide where your email will be archived (for me it is On My Mac). In the newest version of Mail there is an in-built archiving shortcut ^⌘A (which works without Mail Act-On) which archives in the archive of that account. If it comes on your Gmail it will also be archived in Gmail archive.